UMWA Strike Meeting, Bantley Place, Scalp Level, PA, September, 1922. "We are no longer slaves and we are done loading three ton for two. We will never return under a scab system. We want union to protect our rights." -Striking miners at Windber, PA, April 10, 1922. 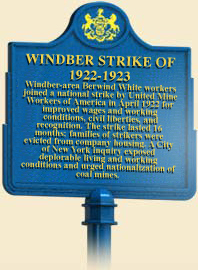 Miners in Windber went on strike in 1922 to gain union recognition, preserve their pay rates, and have coal that they dug weighed accurately so they would be paid fairly by the ton. These men were part of a much larger, national strike. Coal operators and the United Mine Workers of America (UMWA) had agreed in 1919 to wage increases and other gains for worker; however, when that contract expired on March 31, 1922, operators determined to roll back these gains. The UMWA and operators could not agree on a new contract, so John L. Lewis, president of the UMWA, led some 610,000 miners out on strike during the first week of April. 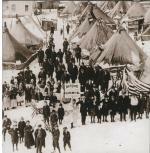 Tent colony of evicted Berwind-White families at Mine No. 40, October 1922. This was the first national strike by both anthracite and bituminous miners. The nonunion miners in Windber also fought for the right to have the UMWA bargain collectively for them, and to end the autocratic control that the Berwind-White Coal Mining Company had over the mines and community. UMWA leaders knew that having nonunion miners turn out was critical to winning the strike. No one knew this better than John Brophy, president of the UMWA's District 2, which included Windber and other Berwind-White operations in Somerset County. 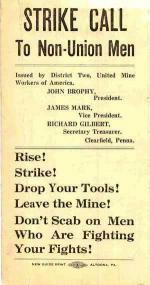 Brophy led a vigorous campaign to bring nonunion workers out of the mines in District 2. The Union welcomes you. Join the organization and gain its protection. You need the Union, and the Union needs you." The miners and the union closed down all Windber-area mines by April 9. For months after, Windber's immigrant fraternal societies supported strikers financially and expelled society members who went back to work as strikebreakers. New leaders rose within Windber's ethnic groups to mobilize immigrants for the strike. Women and children joined picketing strikers to prevent strikebreakers from entering the mines. When the company evicted hundreds of strikers and their families from company housing, other families took some of the newly homeless into their privately owned residences. Other homeless families built tent colonies on the edge of town. The Berwind-White Coal Mining Company fought hard to defeat the strikers and keep its mines nonunion. The company paid for more than 100 additional local police and guards who protected company property and strikebreakers, forced strikers and their supporters off company property, and arrested strikers and women for trespassing, attacking strikebreakers, and other charges. Since the company owned the town, miners had to hold strike meetings outside town. The company also secured court injunctions that greatly limited what striking miners could do to protest the company's actions. It shut off credit at the company store and used spies to gather information and identify organizers. The national strike extended into the summer, when UMWA leaders, mine owners, and federal government officials began negotiating a new contract. The Harding administration pressed for a settlement to end the strike and avoid a coal shortage. On August 15, 1922, operators and the UMWA signed a contract that preserved workers' gains of 1919. John L. Lewis proclaimed victory for the miners, but the contract left out nearly seventy thousand nonunion miners nationwide who had supported the strike, including the miners in Windber. 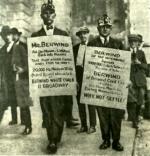 The Berwind-White Coal Mining Company agreed to the contract's wage rates but refused to recognize the union. In late August District 2 officials and representatives of 25,000 miners who had been left out of the contract resolved to continue the strike. In September 1922, a small group of Windber miners and their families traveled to New York City to picket company offices. Delegates from Windber and other Berwind-White mines also petitioned the New York City mayor to investigate conditions in Berwind-White mines since the city's subway system ran on the company's coal. The mayor appointed an investigative committee that visited Windber and other mining towns. The committee issued a scathing indictment of the company after hearing "harrowing tales of suffering and deprivation." The committee concluded that "the living and working conditions of the miners employed in the Berwind-White Coal Mining Company's mines were worse than the conditions of the slaves prior to the Civil War." But the committee's report had little effect on the continuing strike. The Berwind-White Coal Mining Company brought in more strikebreakers, and some of the striking miners drifted back to work during the winter and spring. In June 1923, District 2 officials reduced the amount of strike relief it paid to strikers, and appealed unsuccessfully to the national union for financial support. The strike persisted until August 14, 1923, when striking locals voted to end the turn out. The locals praised District 2 officials for their support, refused to criticize the national UMWA, even though it had abandoned them, and lambasted the coal companies that had defeated them. Miners in Windber and other Berwind-White towns remained under the control of the company until 1933, when the UMWA returned, this time with legal backing from the federal government, to organize miners successfully. Mildred A. Beik, "The UMWA and New Immigrant Mines in Pennsylvania Bituminous: The Case of Windber," in The United Mine Workers of America: A Model of Industrial Solidarity? edited by John H.M. Laslett (University Park, PA: The Pennsylvania State University Press), 1996. Mildred Allen Beik, The Miners of Windber: The Struggles of New Immigrants for Unionization, 1890s-1930s (University Park, PA: The Pennsylvania State University Press), 1996. Heber Blankenhorn, The Strike for Union (New York, New York: The H.W. Wilson Company), 1924.